Beautiful Floors All Over Again! Floors. We walk across them everyday, but there seem to be only two times when we really notice them: when they’re brand new and breathtaking, and when they’re… well, really just not. Whether you have dullness and scratches from Rover and the kids, stains from the company party last night, or chips and cracks from the delivery guy dropping that new furniture or equipment in the entry, Certified Stone Professionals can restore your floors and help you keep them looking gorgeous all the time. Your marble, granite, travertine or other natural stone floor will inevitably show wear over time – scratches, dullness, chips and cracks or other damage. The great thing about stone, though, is that it can be restored by experienced professionals. Certified Stone Professionals can resolve all of these issues and return your natural stone to its original, breathtaking beauty. Sometimes foundations shift, or floors settle, or sometimes they just weren’t installed right in the first place and you end up with uneven tiles, also called lippage. Our lippage removal experts can grind down the stone of these tiles, making them flush with the rest of the floor, then restore the overall finish to its original appearance. Natural stone is porous in varying degrees, depending on its type. The more porous the stone, the more susceptible it is to staining. 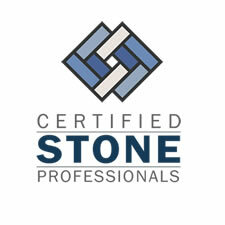 Certified Stone Professionals can seal your stone to help inhibit staining and give you time to clean up. 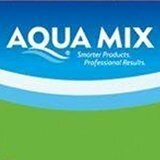 We are certified by several sealing manufacturers, and we know what sealer is best for your surface. We offer a range of sealers, from those neutral in color to those that will actually enhance the color and richness of your natural stone floor. The floor sealers can be impregnating, topical or a combination of both. These floor sealers have a water, solvent or polymer base. Sometimes, however, stains happen. We are able to resolve most stains on your granite, marble, travertine or other natural stone floors. 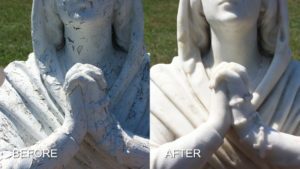 We encourage you to consult us before doing more than wiping up the stain with clear water and a plain white towel, as some cleaning agents can actually permanently set stains in certain types of stone, while others can cause surface damage. Etching is part of that surface damage mentioned above. Often people mistake it for “water rings” or “water spots.” Etching is caused by a chemical reaction between the stone and acidic substances such as citrus juice, wine, tomato sauce, and so on, as well as, unfortunately, many off-the-shelf household cleaning products. But even if you’re dealing with a truly epic party spill, our knowledgeable technicians can hone away etching and re-polish your floors to their former splendor. Floors take a beating, no question. Sometimes they develop chips and cracks that mar their handsome appearance. Certified Stone Professionals can repair and blend most chips and cracks in natural stone so that only you will ever know the stone was damaged. For porcelain, ceramic, and other tile floors, we can carefully replace damaged tiles and repair any missing or cracked grout to restore your floor to like-new. Do you have dull areas? Is the finish of your floor uneven? Or maybe you just want a different look? Certified Stone Professionals can bring back a uniform shine, change a honed (matte or satin) finish to a highly polished one, or vice versa. Often, it is not so much the tile that is dirty as it is the grout. Unsealed grout is porous and will absorb whatever is spilled on it, including unsanitary and odor-causing bacteria. Our equipment deep-cleans and sanitizes your grout, removing contaminants that regular mopping alone can’t touch. We can then seal your grout to enhance stain resistance and make daily clean-up much easier and more effective. Sometimes grout discoloration cannot be completely resolved, which is one, but not the only reason we offer grout color sealing services. Grout color sealing not only applies a uniform color to all grout lines, but also contains constant acting mildewcides for healthier, more sanitary floors. It can be done in virtually any color you choose, including covering a dark color with a lighter one. Marble, travertine, limestone, tile & grout, Saltillo, terrazzo, concrete… We know what it takes to make your floors say, Wow! all over again. From epoxy coatings, either clear or in an unlimited color palette, to urethane top coats to polyaspartics, we provide seamless, flexible, waterproof coatings to meet your flooring needs. For a FREE estimate on professional honing, polishing, cleaning, sealing, and other restoration services for natural and engineered stone, tile, terrazzo, and concrete floors throughout Western New York, including Rochester and Buffalo, contact us online or call (716) 759-4200 today.